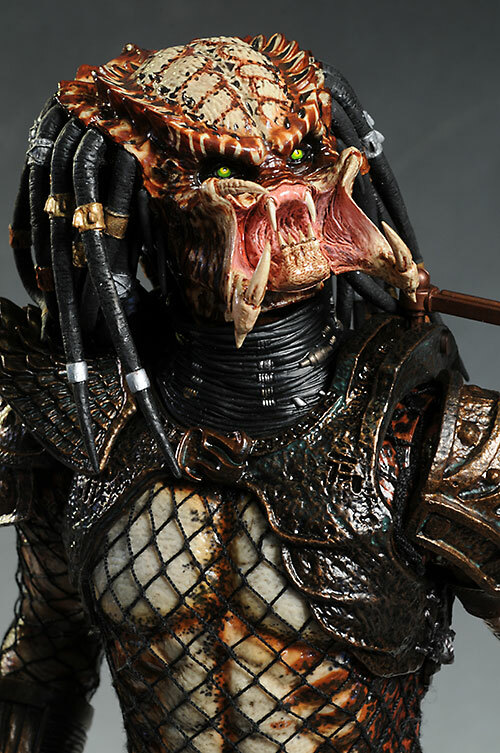 I've said it before and I'll say it again - the Predator costume/makeup design is one of the best in the history of film. That doesn't mean the films have been the best. I love the original of course, but the second movie left a lot to be desired. It's possible I'm not being completely fair, since I've only watched the movie once, the weekend it premiered at the theater. I hated it then, and never went back to give it another shot. 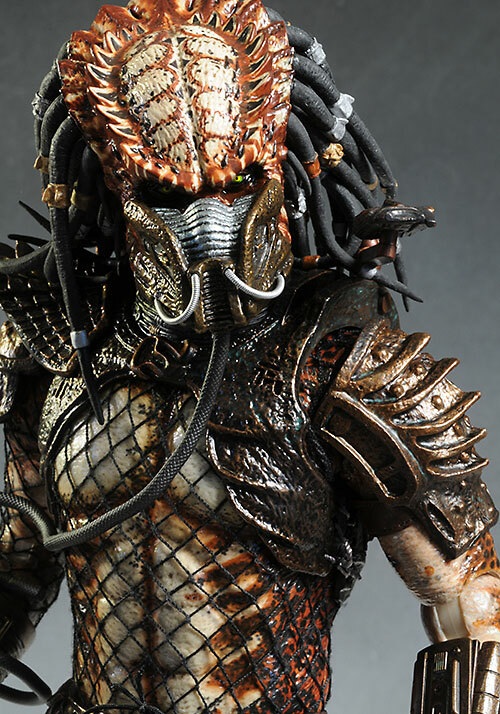 But the Predator was just as good as always, and in some ways an improvement over the original costume. 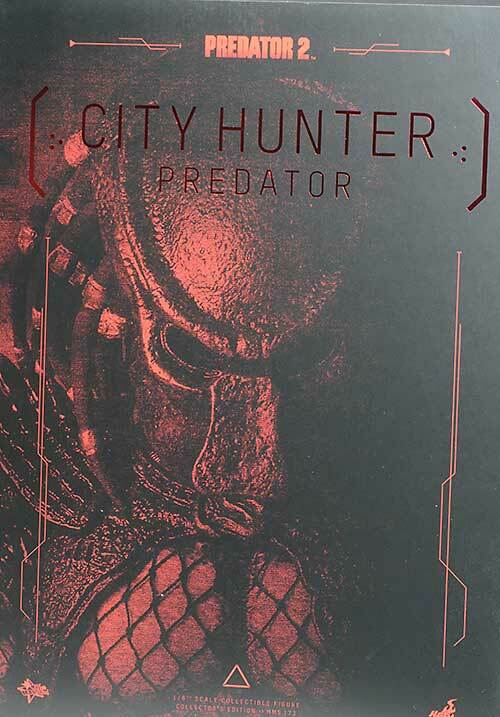 Hot Toys has done some amazing Predator sixth scale figures, and their latest release is the City Hunter Predator, from Predator 2. This is not a cheap figure, but you knew that already - I did say 'Hot Toys' after all. This is not a DX, but he comes in at $200 - $220, depending on the retailer. I've included a lot of photos with this review to properly show off the accessories, so be sure to scroll all the way down. The recent Hot Toys packaging has gotten fairly basic - at least for them. This is simply a slip cover over a window box. There's very little text, and very few graphics, but it is completely collector friendly, which is always a huge plus. There's also some reasonably good instructions, which help with a number of the accessories and their placement. Even though it is basic, I really like the reddish tint that the cover and text has - very appropriate. 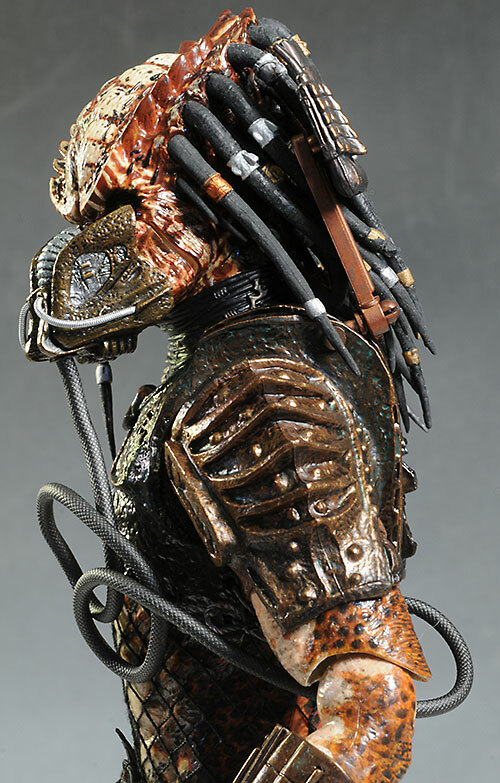 If you compare this figure to one of their early Predator figures (I included a photo of this one and another early figure near the end of the review), you'll realize that there simply is no comparison. 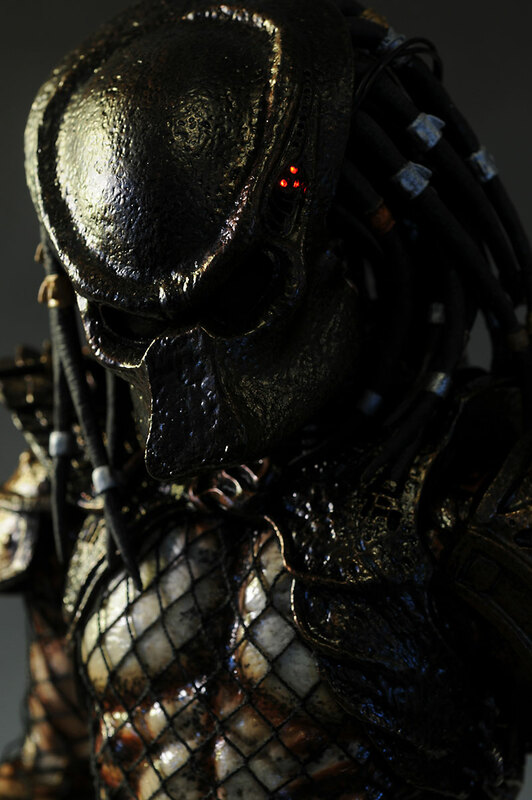 The dreads are so much better there simply aren't words to describe it, and the shape of the head, size of the body, and detailing on the armor is as drastic of an improvement as electricity over candles. While this figure has no extra head sculpt, he does have the extra mandibles, gas mask and the armored mask. More on that in the Accessories section, but suffice to say here that he has not one, not two, not three, but FOUR different looks! All of them are great, although I'm betting most folks will end up sticking with either the open or closed mandibles for their display. Either way, the sculpts look fantastic. I briefly mentioned the rubbery dreadlocks earlier, but their worth mentioning again. Unlike early versions, these flow cleanly down his head, with no gaps or weird empty space. It seems like these get more realistic with every release. He's a big boy of course, coming in at about 13 3/4" when standing in a relaxed pose. His bulk is appropriate to the height, so the limbs and body don't appear skinny or undernourished. The armor has a hammered texture, and the body netting fits tightly and remains nicely in place. Thank God we don't have to fit the netting on ourselves anymore! 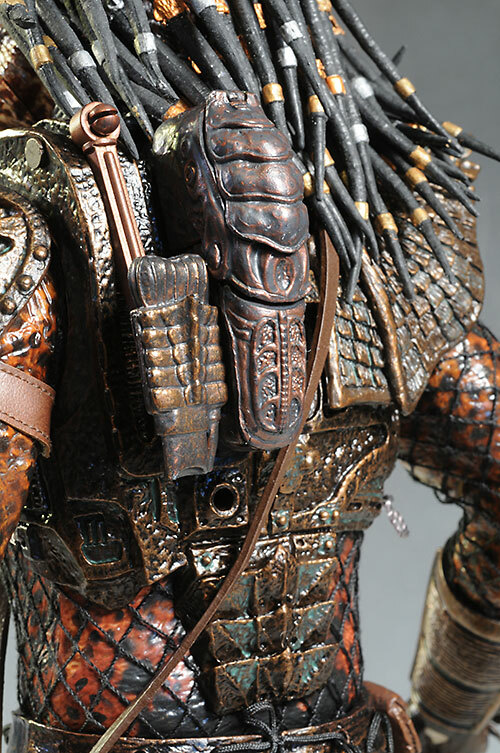 This Predator has a different style shoulder gun. It's smaller and flatter, easier to store out of the way on his back. 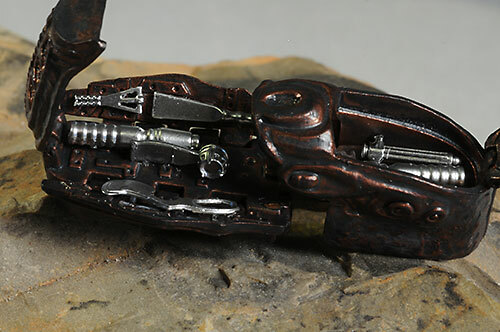 I really like this design, as well as the articulation at the body and under the gun itself. There is one negative though. On the very underside of his jawline, there's a pretty noticeable flashing line from the mold. You won't notice it unless the head is tilted back, but it's still surprising for a Hot Toys figure. The cool painted pattern on the head and face looks outstanding, with a very organic, biologic appearance. The shading and transition is realistic and movie accurate. The body sports this same cool skin pattern, and while it is slightly shiny, it isn't ridiculously glossed up, unlike some other recent releases. I was quite impressed by the yellow eyes as well, which stand out extremely well this time around. Perhaps it's the dark coloration of the skin around them that makes them pop, or they just used a particularly neon color. Regular buyers of Hot Toys figures know that all the articulation you expect is going to be here, with joints galore. The obvious missing articulation is the ab-crunch, but that makes sense - it would be way too obvious with this body. Most of the joints are very tight - almost too tight in some cases, like the elbows. On the opposite end of the spectrum were the ankles, which were a tad too loose this time around. Even with those huge feet, I had trouble getting him to remain standing, something that should never be the case with a Hot Toys figure. But the big issue for me in this category is how easily the hands, feet and head pop off the body. Even with basic handling, they ended up coming loose. The head was the most troublesome, coming off with only a slight amount of pressure. The hands were pretty troublesome as well, and the issue here is that the neck, wrist and ankle posts are simply too short for the armor design. Other than the normal articulation, there's two other areas were pieces move. I already mentioned the shoulder mounted cannon, which can tilt up and down, turn, and even be stored against the back. There's also the extendable metal blades on his right arm, and while they don't move a whole lot, it's enough to be noticeable. Now this is the sort of assortment of extras we should see with every figure. 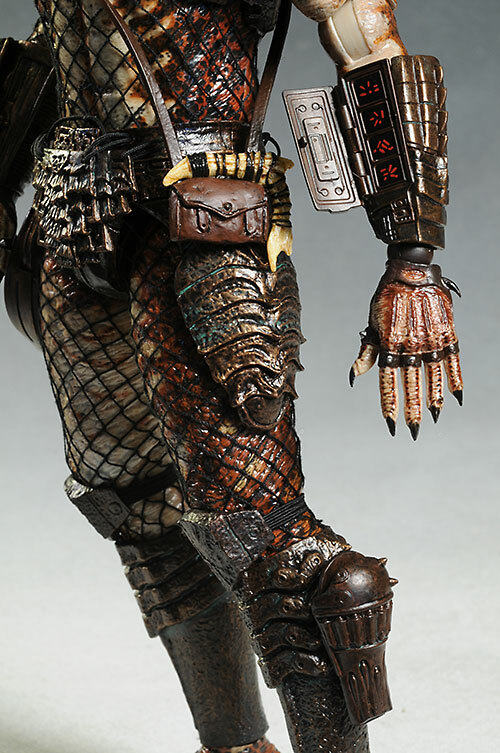 He comes with 7 extra hands - a pair of fists, a pair of relaxed hands (one of which is designed to hold the net launcher), a pair of gripping right hands (one for the spear, one for the disc), and a pointing right hand. If you're paying attention, you'll notice that there's not much for the left hand for gripping, which was disappointing. Both relaxed pose hands are for the left, and it's tough to find a way for him to hold both the spear and the human skull at the same time. 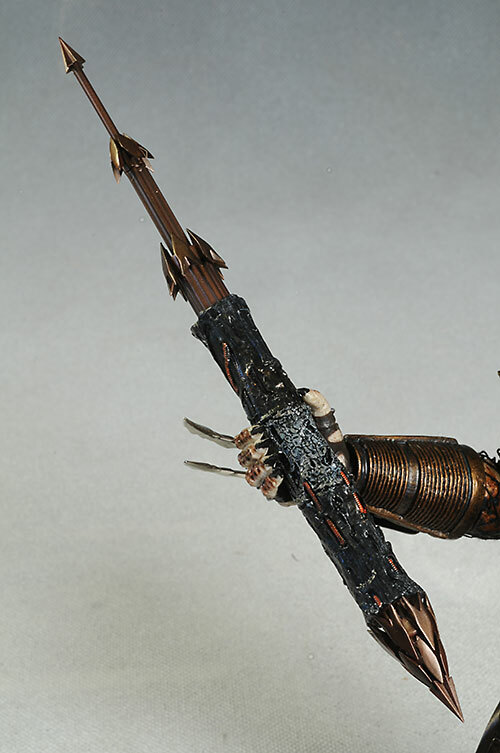 For weaponry, he comes with both the expandable spear, which has two sections on either end, as well as the extendable (slightly) throwing disc. The disc attaches to his hip on the circular holder, and can be held with the specific hand. To heal his wounds, he comes with a complete medical kit that attaches tightly to his back to the right of the cannon and just above the hole for the breathing mask hose. This kit opens up - pay attention to the instructions to get it right without breaking anything - to show off the instruments. They aren't removable, but they look extremely cool in place. As I mentioned, there's the mask that attaches to his face, and has a hose that runs around to the back of his armor. But there's not just one - there's a second that's designed to be held in his hand! That's another cool extra that I wasn't expecting. There's a couple additions to his costume as well, including a small bone bag that goes over his head and shoulder, and the net launcher that attaches to his left calf. One of the coolest accessories is the severed stump of a left arm. The arm detaches at the elbow joint, and the half arm pops on. It's one of those rare accessories that's likely to be used in a lot of displays. While we've seen the next accessory before, it's always a nice extra - a bloody human skull, still attached to the spine. He can hold it in one of the gripping right hands. Lastly, there's the basic display stand. It's not required to keep him upright, but it's good for consistency if you're using them in your display with other figures. I've already discussed most of the Outfit aspects in other categories, like Sculpt and Paint. The armor and netting looks terrific, just as you'd expect. I do have one nit though, which ties in with the Articulation issues. You could argue that the posts in the hands and feet aren't too short, which I claimed earlier, but that the armor is too long. Either way, the result is the same. I haven't mentioned the armored mask yet, but that's only because we've come to expect one. The light up feature works nicely, although the LED isn't quite as bright as I'd like. It does attach cleanly and easily to the back, and the small switch is easy to reach. While the head popping off easily was generally annoying, it did come in handy when attaching this mask. It's a tight fit, and being able to hold the head in one hand while pushing it in place made the process much easier. The issues with the articulation make this figure more frustrating to work with, hurting the score here. Obviously, this isn't a figure kids will haul out to the sandbox, but even the collectors and fans that it is intended for will find it a bit more annoying than necessary to pose and adjust. If you can get this guy for $200 or less, you can add another half star here, bringing him up to an average value. I'm rating him at the more likely $210 - $220, and while he has a nice assortment of accessories, that's still a bit too high. Remember that parts can pop off - don't pick him up by the head unless you have a hand on the body too. The joints are quite tight as well, so make adjustments with even pressure. 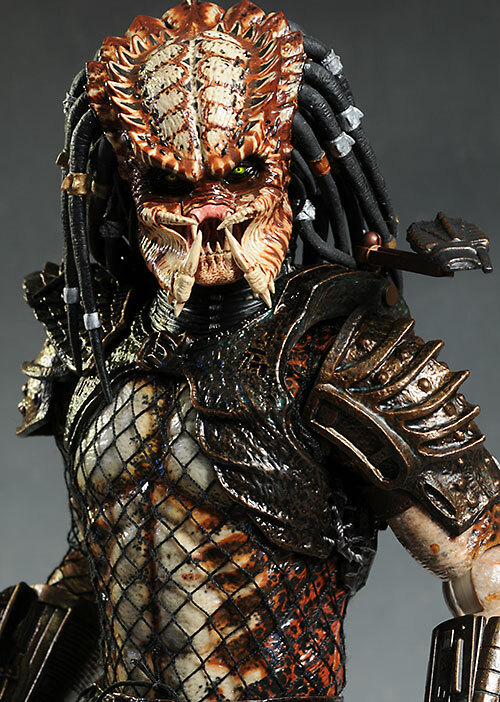 This is a terrific Predator, and a much better version than they produced several years ago. I have no idea how long they'll be able to continue raising the bar, but so far, so good. The real advantage here is the multitude of display looks. 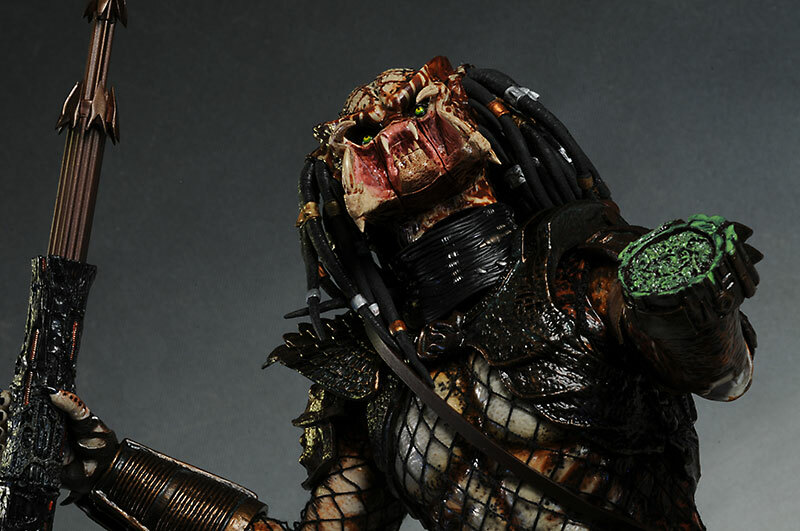 With the four different ways to set up the face plus the severed arm, you can come up with a really unique look that will set him apart from the other Hot Toys Predators on your shelf. - has it for $205. 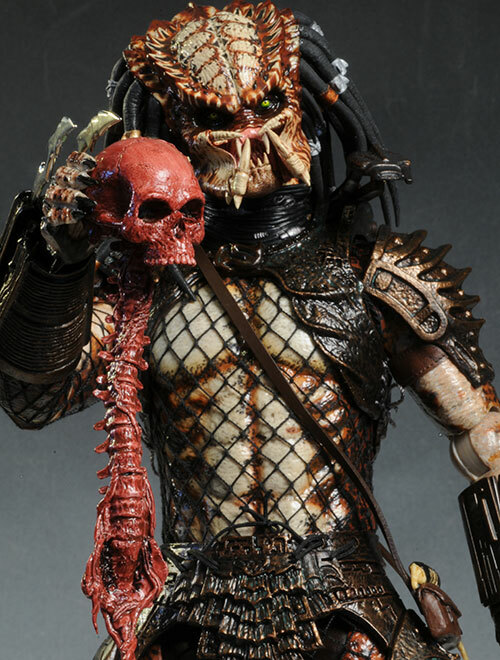 I've had a lot of Hot Toys Predator reviews. The most recent was their very cool Samurai version. 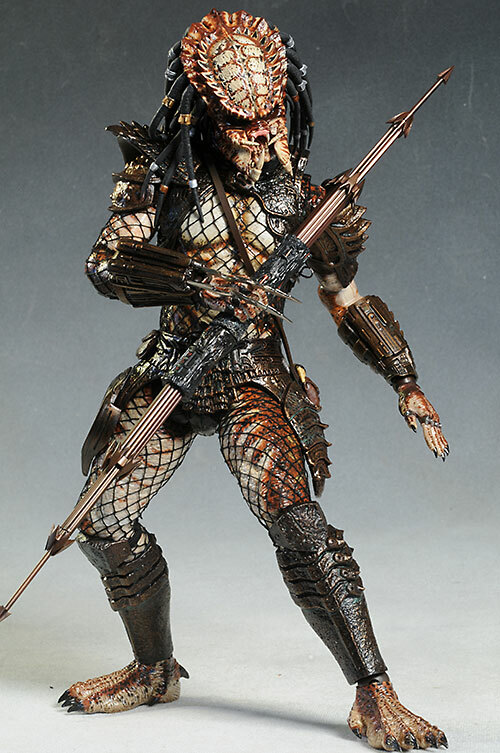 Before that, there was the Classic Predator from Predators, Noland, and Royce, Falconer Predator, and Berserker Predator. 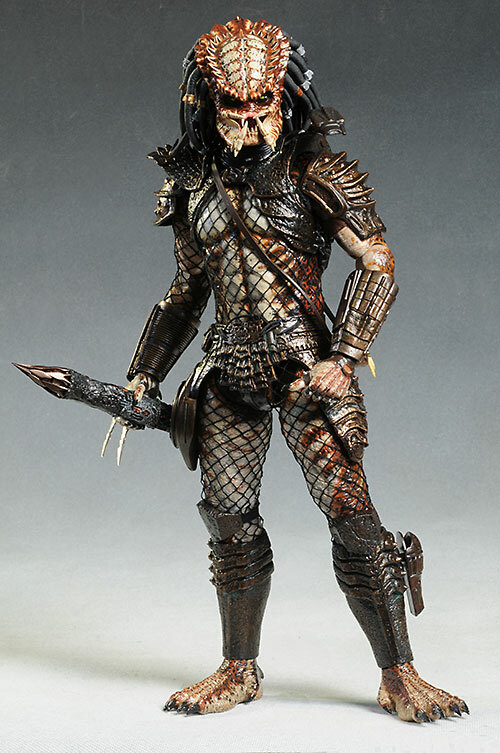 Hot Toys has done several figures from the original Predator flic as wellk, including the big guy himself, Billy and Dutch. 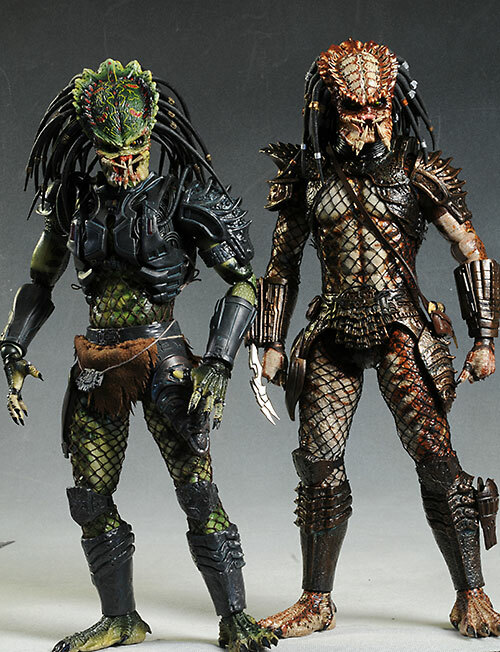 Then there's the Hot Toys Lost Predator, and the Machiko She Predator.